These are a cool growing species with Odontoglossum Orchids originating in South America, however at high and cool elevations. A species that has been overlooked are the Odontoglossum orchids. Now becoming popular as an easy to grow species, but also because of the colorful and long lasting flowers. Odontoglossums are easy to grow and the flowers are not only colorful but are long lasting and often fragrant. 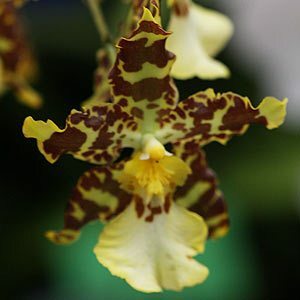 Right we have pictures Odontoglossum spectatissimum. Many hybrids have appeared over the years some being very attractive. What we generally see offered are perhaps better called the Odontoglossum Alliance Mericlones group of orchids. Easy to care for in fact you could grow these in containers in a nice sheltered position in the garden in a mild climate. They are a cool climate orchid, however no cold winds or indeed hot winds. Good humidity is one of the keys to successful cultivation. The higher the temperature the greater the humidity. They like good filtered light and this can be judged by the foliage color, a ‘bright green’ is what we are looking for. Reddish tones indicate to much light, dark green to little. Protection from direct sun is essential as leaf damage will quickly occur during summer. Try growing outside in containers under a 75% shade cloth, higher rating in hot climates. In cooler areas a greenhouse may be required. 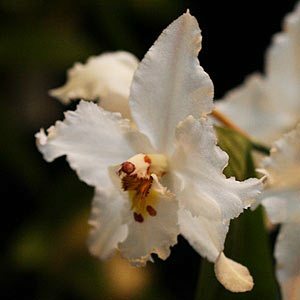 They do require good drainage and like nearly all orchids Odontoglossum thrive on regular fertilising and in a suitable potting mix. We suggest a specialist orchid fertilizer. Odontoglossum crispum (pictured right) with its curled leaf margins and red spotted lip is a white flowering epiphytic species widely used for hybridization. Flowers are large and appear in winter they have an attractive sweet fragrance.